Russia: New Years – Food Traditions? 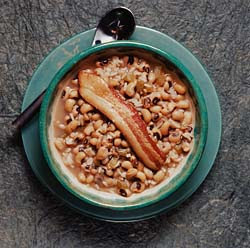 A traditional Southern New Year’s meal includes ham, cornbread, black-eyed peas and collard greens. Both black-eyed peas and collard greens are considered especially lucky additions to the dinner table. Black-eyed peas are thought to bring wealth because they look like little coins, in addition to the fact that they swell when cooked — a sure sign of prosperity. Collard greens are considered lucky because they are green, like greenbacks — money! This is the food we ate at New Years when I was growing up and I passed this on to my kids!